Bats are species that are not very visible to foresters (and most people in general) and therefore it may happen that their requirements in forests are overlooked. 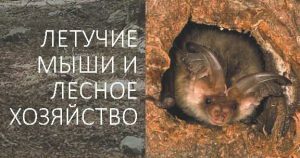 This leaflet gives good practice guidance for bat-friendly forestry in Belarus. The Belarussian Forestry is in the process of FSC certification, with over 70% of the forests being managed according to FSC criteria. This implies that the foresters take the well being of wildlife into account in their management and exploitation of the forests. Bats are species that are not very visible to foresters (and most people in general) and therefore it may happen that their requirements in forests are overlooked. To increase the awareness among foresters and biologists about bats and specifically bats in forests The Habitat Foundation organised, in collaboration with the Bat working group of BirdLife Belarus APB, two workshops about bats and forest management in 2012. After the workshops it was decided to produce a brochure about bats and forestry and a more popular leaflet about the same subject. Both will be disseminated among the Belarussian institutes and universities of Forestry and Biology. For the latter we chose to have the existing leaflet of EUROBATS translated from English to Russian. This one is ready now and can, with the permission of the Belarussian government, be disseminated. The more elaborate brochure will be ready at the end of this year. The leaflet can be downloaded here (PDF file).